I know, I know, worst title in the the history of blogpost titles. That must be because I was slightly panicking when we decided on this theme: sheer lipsticks. Sheer? I don't do sheer! Bold is my middle name when it comes to lipstick! Excepted: not really. I actually wear a couple of sheer colors and there is one I wear a lot, especially since we got reunited a few weeks ago. I had been looking for it for a couple of months, and it was quietly waiting for me under my car seat! Since I found it back I have worn it loads, and let's face it : it's sheer. Isn't it the prettiest sheer peach? 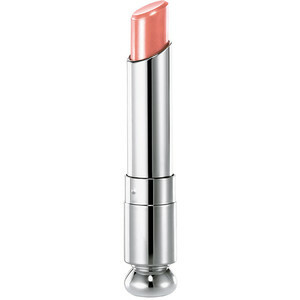 I love the Dior Addict lipsticks because their formula is moisturizing and easy to wear, they're almost like a balm but they are more pigmented, although quite a few colors like this one are on the sheer side. I wear this one with virtually everything! It's very pretty and natural :) I love the Addict tubes, too - so chic. It's looks so natural and lady. Your look so beautiful wearing it. I love peachy shade for summer. I'm desperate to find a coral/ peachy shade now!